Posted on August 19, 2015 by Chad F.
Happiness is often compared to being priceless so all of us know how lucky it would be to live in an environment full of happiness. And just imagine if you are living in a happy country! Wouldn’t it be great from the time you wake up till you hit the pillow every day to be surrounded by positive people who are happy? Do you know that based on statistics, people living in happy countries generally live longer, experience more generosity, enjoy better social support, encounter lesser corruption, celebrate a higher gross domestic product per capita (GDP), and are granted more freedom to make their life choice? 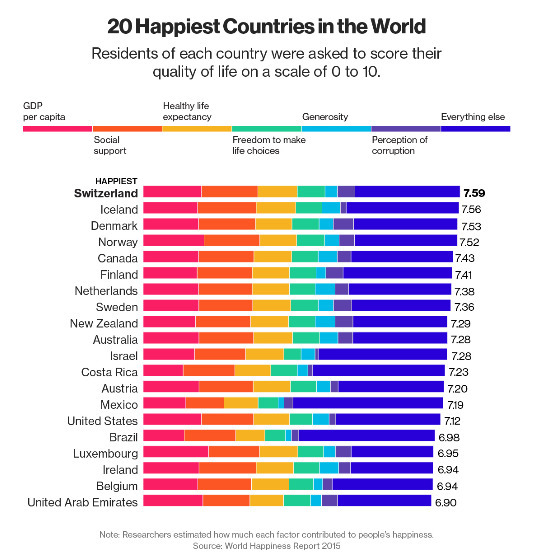 Well, if these scenarios interest you, perhaps you should live in one of the following happiest countries in the world as indicated in the World Happiness Report 2015. Maybe it’s the work of the Swiss chocolate that makes this country the ultimate leader of all the happy countries in the world according to the latest statistics. Switzerland knocked the runner-up, Iceland, with a close shave and is ranked as number one on the report. This country is situated in Western and Central Europe, and borders many other countries such as France to the west and Italy to the south. Based on research done by Credit Suisse, this beautiful country also has the highest nominal wealth in the world, per adult. Its cities such as Geneva and Zurich have constantly been ranked in the top lists of cities with high quality of living. Previously ranked as the happiest country, Norway has slipped down three places to number four. Nevertheless, many people will always perceive Norway as a perfect country to settle down in. For me personally, one big reason to live in Norway is that I will be VERY happy living in the capital city of Oslo where there are a handful of Michelin Star restaurants for me to indulge in. Do you know that the sun never sets in some regions of Norway during summer months? For those who love the outdoors, North Cape area will be a great place to live in because the sun stays out for 24 hours! From the Down Under, you can find warm, jovial and fun people in any city you head to. Being one of the wealthiest countries in the world, Australia also ranks high in many areas globally, such as education, health and protection of political rights. Cities such as Melbourne, Sydney and Perth are also hot travel favorites that attract millions of visitors each year due to the abundance of attractions in these cities. Did you know that the United States is one big happy country? Ranking at number fifteen, America has won many people over due to its status of being a developed country. We actually have the world’s largest economy based on real GDP and nominal GDP! The United States feature many world class states such as New York and many institutions located in the US are considered global leaders in their respective niche areas. When you think of Brazil, it’s hard not to associate it with fun, colors and lots of partying! Brazil is the largest country in Latin America and South America, and is often considered as one of the fastest growing economies in the world. The Brazilian culture is vibrant and robust, and the people certainly show a lot of passion in continuing the Brazilian traditions. For a soccer fan, Brazil will certainly make him or her very happy to live here where this sport is part and parcel of the local lifestyle. Do you live in a happy country? Share with us!